Sony annonce pour le 11 décembre 2018, le film The Equalizer 2 (Le justicier 2) en format Blu-ray et DVD, réalisé par Antoine Fuqua et mettant en vedette Denzel Washington, Pedro Pascal, Ashton Sanders, Jonathan Scarfe, Melissa Leo et Bill Pullman. Ancien agent des services secrets américains à la retraite, Robert McCall occupe son temps à aider les autres. Entre secourir des gens en danger, faire le taxi pour un vieil homme et servir de modèle à un adolescent, le soixantenaire n’a pas de quoi s’ennuyer. Lorsqu’il arrive malheur à une vieille amie, le justicier tente de faire la lumière sur ce qui s’est passé. Son enquête le rapproche d’un ancien collègue de travail, le replongeant dans ses souvenirs encore douloureux. La menace se rapproche de lui et il devra réagir avant d’y laisser sa peau. TORONTO, Ontario (December 4, 2018) – Two-time Academy Award® winner Denzel Washington (Best Supporting Actor, Glory, 1989; Best Actor, Training Day, 2001) returns to one of his signature roles in the first sequel of his career when the gritty, pulse-pounding thriller THE EQUALIZER 2 hits digital November 13 and 4K Ultra HD™/Blu-ray™, Blu-ray Combo Pack and DVD December 11 from Sony Pictures Home Entertainment Canada. Reunited with Director Antoine Fuqua (Training Day), Washington is Robert McCall, who serves unflinching justice for the exploited and oppressed, but how far will his no-holds-barred vengeance go when the victim is someone he loves? THE EQUALIZER 2 also stars Pedro Pascal (Kingsman: The Golden Circle), Ashton Sanders (Moonlight) with Bill Pullman (Independence Day) and Oscar® winner Melissa Leo (Best Supporting Actress, The Fighter, 2010). Four additional featurettes are also available on the digital, Blu-ray and DVD releases of THE EQUALIZER 2, including the two NBA promo shoots. This sequel packs more punches, explosions and bullets than the original, and in “Seconds Till Death: Action Breakdown,” the cast and crew dissect some of this film’s most intense and action-packed moments from rehearsals to production. It takes a certain kind of actor to play alongside Denzel Washington and in “Through Antoine’s Lens: The Cast,” Antoine and Denzel discuss why the returning cast are such an important part of this sequel’s success, as well as what it was like working with new cast and characters. Directed by Antoine Fuqua and Written by Richard Wenk, THE EQUALIZER 2 is based on a television series by Michael Sloan and Richard Lindheim. The film is produced by Todd Black, Jason Blumenthal, Denzel Washington, Antoine Fuqua, Alex Siskin, Steve Tisch, Mace Neufeld, Tony Eldridge and Michael Sloan, with Molly Allen and David Bloomfield serving as executive producers. 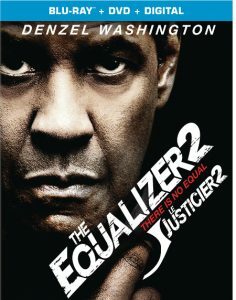 THE EQUALIZER 2 has a run time of approximately 121 minutes and is rated 14A.